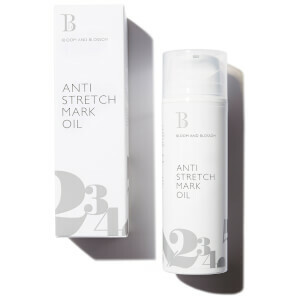 Improve skin tone and texture with the Anti Stretch Mark Cream from Bloom and Blossom, a brand created by sister-in-laws with a passion for developing a natural skincare range for new and expecting mums. Massage onto clean, dry skin twice daily, paying particular attention to problem areas such as abdomen, breasts, hips, buttocks and thighs. Aqua (Water), Prunus Amygdalus Dulcis (Sweet Almond) Oil, Theobroma Cacao (Cocoa) Seed Butter, Cetearyl Olivate, Sorbitan Olivate, Butyrospermum Parkii (Shea) Butter, Chlorella Vulgaris Extract, Glycerin, Cananga Odorata Flower Oil, Equisetum Arvense Leaf Extract, Tocopheryl Acetate, Xanthan Gum, Sodium Stearoyl Glutamate, Phenoxyethanol, Ethylhexylglycerin, Linalool*, Benzyl Benzoate, Benzyl Salicylate, Farnesol, Geraniol, Isoeugenol, Eugenol, Benzyl Alcohol. Smells gorgeous and applies very smoothly on to the skin - best of all it contains no nasties. It's a pregnancy must-have.